The rate of poverty in Nigeria is really making people for stupid and desperate as ever. 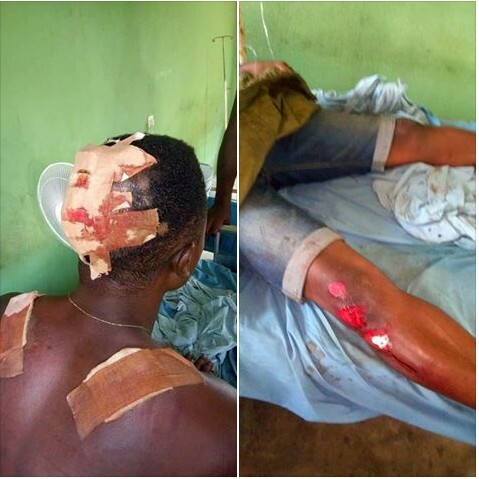 A young man who was almost killed after encountering scammers while traveling in Abia state just narrated his ordeal with this hoodlums. Just happened this evening. Okey Nwapu Evans is my brother from Amakohia who mistaking entered one chance taxi in isinweke to umuahia. On their way to umuahia opposite Uboma secondary school near late Eze Ovuike's house the 419 guys introduced a business worth of millions to him which he told them that he is not interested. Immediately he declined the request of the business the both party had misunderstanding. They guys started fighting him and over powered him. As they reached Ekeikpa market in Amainyi he tried to alert people from the window they guys joined hands together and pushed him out from the car window. Which he gravely wondered. God so kind some motorcycle riders immediately went after them, which they followed them till they diverted from 7 and half to Otoko on their way they had accident and was caught by Obowo police division Otoko. While the matter was reported to Ihitte/Uboma police division, they immediately went to Obowo and carried them back to isinweke. And their car is still at Obowo police station. Imagine how funny Nigerian police is I personal Uwas Onyenku went to Ihitte/Uboma police station to confirm their arrest. Could you imagine that the police man in charge of they case told me that those 419 guys will go free because their Boss who sent them for the mission has called from Isialangwa in Abia and said nobody should touch his boys.